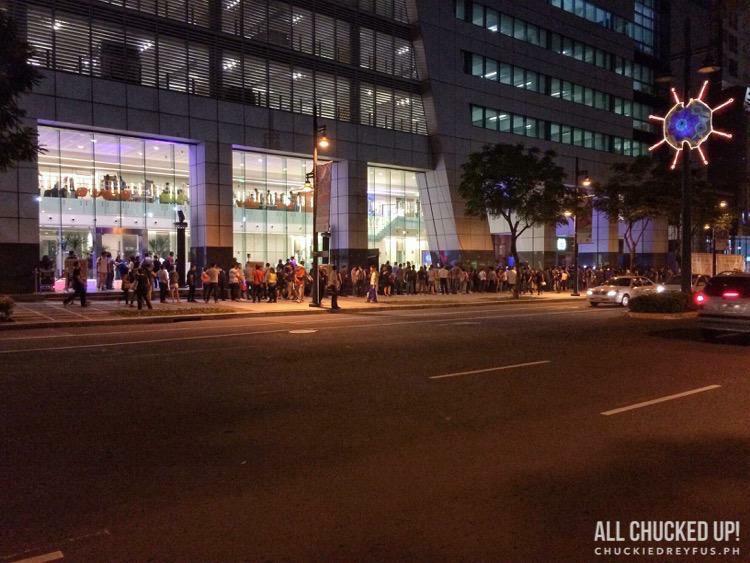 That wonderful Globe iPhone 6 launch moment! - All Chucked Up! 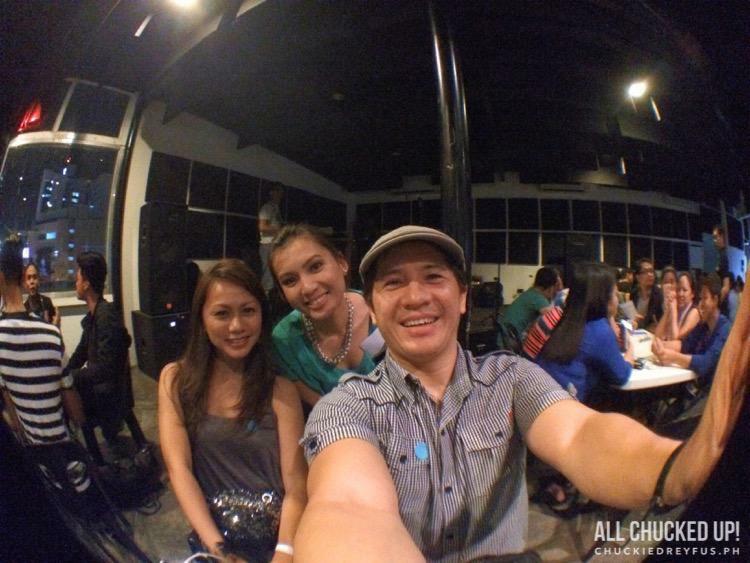 You are Here >> Home >> Events >> That wonderful Globe iPhone 6 launch moment! Over at Skinny Mike’s, it was no different. Friends and acquaintances gathered together with some of our Globe buddies. It was a happening place! 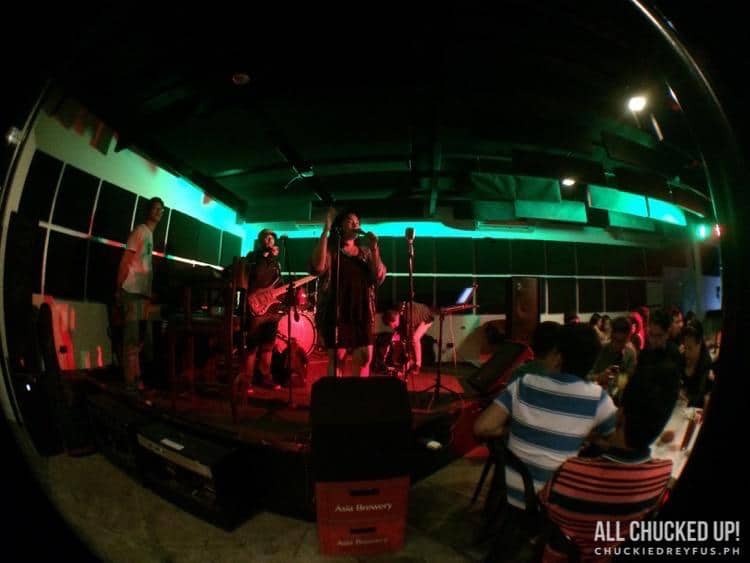 A few hours before the countdown to the Globe iPhone 6 launch (which happens at midnight), food and drinks were overflowing and music was provided by way of an awesome Rockaoke! I actually enjoyed the party a whole lot, too, because the band providing music and rockaoke accompaniment was playing non-stop ’80s and ’90s music. Perfect! I was going through my Instagram timeline and even found out that a lovely couple spent their 22nd Wedding Anniversary waiting in-line for the Globe iPhone 6! Wow. Finally… just moments before the stroke of midnight, everyone was asked to head straight to The Globe Tower to join in on the countdown. Yes! The Globe iPhone 6 Launch was about to happen. The Globe iPhone 6 Launch! You could feel the electricity in the air, not to mention the sea of people all giddy and anxious to have and hold their very own Globe iPhone 6 units. 10… 9… 8… 7… 6… 5… 4… 3… 2… 1… Hooray!!! It felt like New Year’s Eve! The Globe iPhone 6 launch is officially underway! So, in true Apple fashion… the very first person to get his hands on a Globe iPhone 6 unit (who probably staked out since daytime) was accompanied by cameras and joyful Globe employees as he was led to the Globe store. As soon as his beautiful Globe iPhone 6 Plus unit was handed over to him, cameras from the media started clicking away and Globe peeps posed for photos with him. It was really fun. 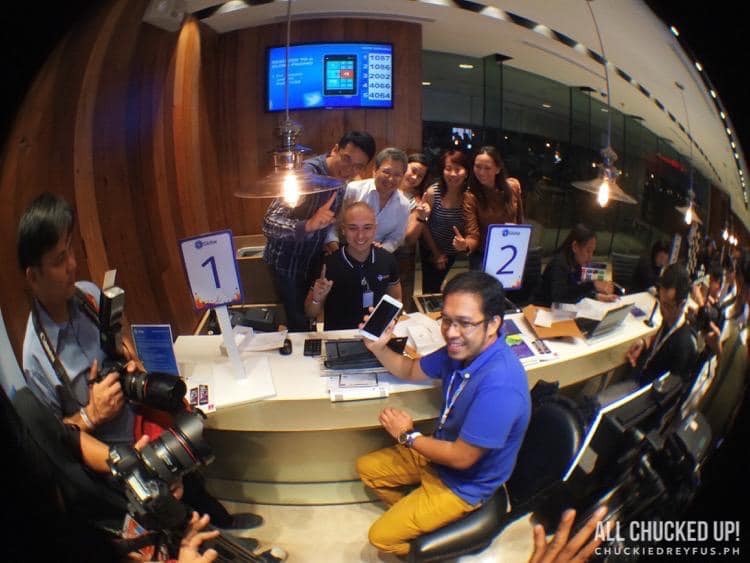 The very first person to get the #GlobeiPhone6 – Mr. Hermogenes Escala. Congratulations, Mr. Hermogenes Escala. Your long wait has truly paid off. 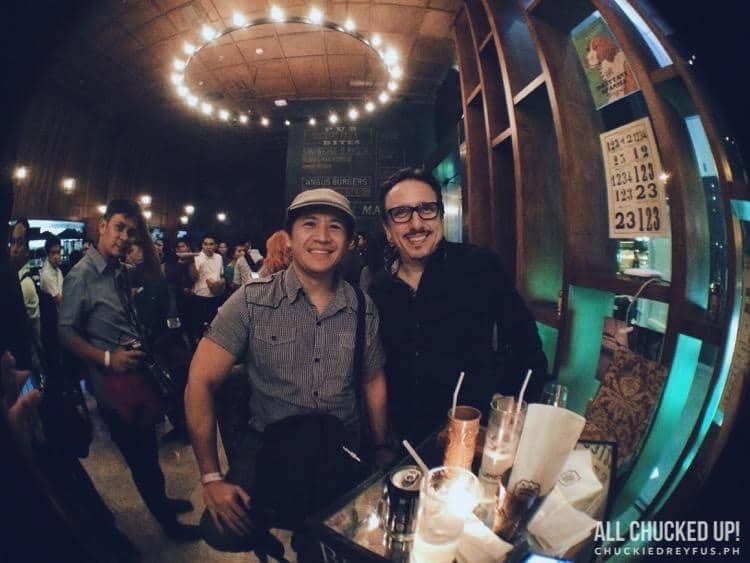 As more and more jolly subscribers started entering the Globe store, we were eventually led downstairs to The Hungry Hound and Niner Ichi Nana to continue celebrating the Globe iPhone 6 launch, where we could hangout, drink, eat and chat with Globe friends and executives. It was the perfect opportunity to share pleasantries with them and also to ask them a couple of questions in a laid-back atmosphere. My wife and I were able to sit down and share a couple of laughs with Globe’s Chief Operating Adviser, Peter Bithos. During our conversations with various Globe officials, I was able to learn more about Globe’s amazing offerings and services that greatly compliment the new Globe iPhone 6 and iPhone 6 Plus. This is Globe’s very successful program that allows postpaid customers to easily renew their subscriptions in order to get the Globe iPhone 6 or iPhone 6 Plus. It doesn’t matter how early you are into your current subscription. All you have to do is pay a “reset fee” (price varies depending on how far off your current subscription is to its expiration) and you’re all set! Very easy, right? The Reset Program is being offered until December 31, 2014. Yes! The revolutionary mode of payment that was initially launched for the Google Play Store is now finally being offered for the Apple App Store! No credit card? No problem. With Globe’s Direct Carrier Billing, you can easily purchase apps in the Apple App Store by charging the cost of the purchase to your postpaid line or prepaid credit. Incredible, right?! Other networks do not have such an option. Just one of the many reasons why you’re better off getting an iPhone 6 with Globe. To know more about Direct Carrier Billing on the Google Play Store, read an in-depth article I previously wrote about it. Of course, as soon as you get your very own Globe iPhone 6 or iPhone 6 Plus, you’re gonna want to purchase cases to keep them safe and scratch-free. You might also think of getting other really cool accessories for your new gadget. Well, you guys are definitely in luck! Customers (old and new) who are getting the Globe iPhone 6 or iPhone 6 Plus are entitled to a cool 35% discount on Ballistic, Speck and Tech 21 products at Beyond the Box and Digital Walker! You also get 25% OFF on all powerbank brands. That’s not all… you can also avail of 30% discount on Lab C, Opt and Moshi cases, Mili powerbanks, Belkin accessories, Divoom and Doss Bluetooth Speakers at all Switch establishments. Offer is available from November 14-16, 2014. Redemption is until March 31, 2015. Maximize the power of your new Globe iPhone 6 and iPhone 6 Plus by downloading the amazing selection of “G Apps”. These new Globe Apps were developed to help you enjoy a complete digital experience. Apps that can help you do things like… find great deals online (GDeals), purchase movie tickets (GMovies), store important files and photos in the Cloud (Globe Cloud), manage and change your Globe subscription (GServices) and more. Exciting perks and freebies are up for grabs for customers getting the iPhone 6 or iPhone 6 Plus from Globe on November 14. You can read all about my G Apps in-depth review here. 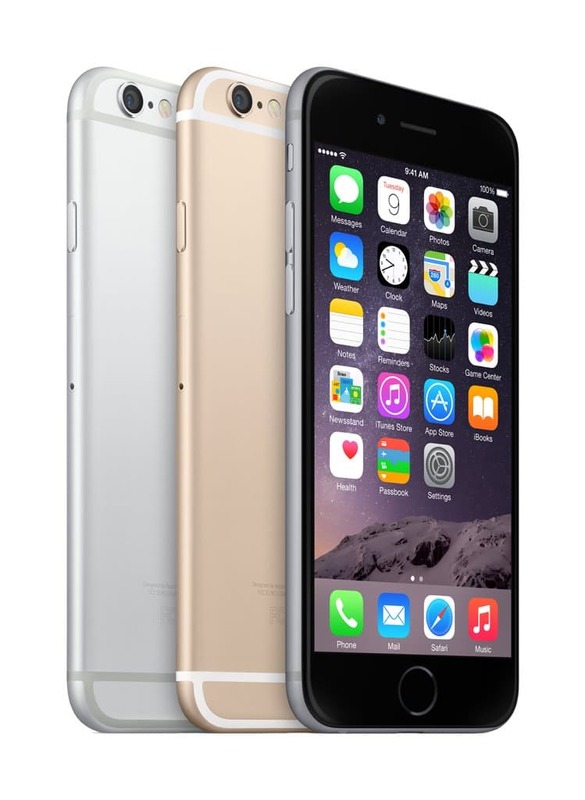 Get the Globe iPhone 6 or iPhone 6 Plus now! Globe is offering the iPhone 6 (16GB) at Plan 1299 with P800 monthly cashout good for 24 months, while the iPhone 6 Plus (16GB) is available at Plan 1299 with P1,000 monthly cashout also for 24 months, payable through major credit cards at 0% interest. You’d be crazy not to get the iPhone 6 or iPhone 6 Plus from Globe. Join in on the fun… it ain’t too late! I’d also like to congratulate everyone who waited for hours outside the The Globe Tower during the Globe iPhone 6 launch just to get their hands on this incredible smartphone. 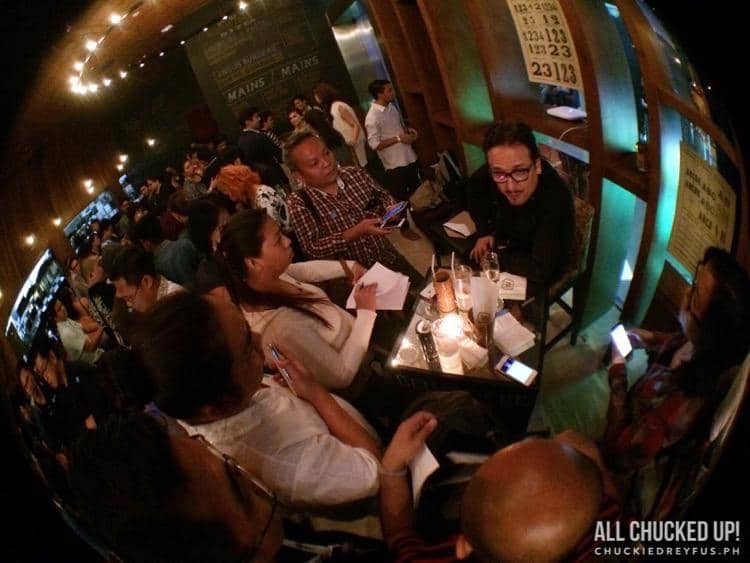 Likewise, congratulations to Globe Telecom for a spectacular Globe iPhone 6 launch event. The long line of eager customers as well as over 10,000 subscriber pre-registrations says it all. Cheers! ‹ Mobile Education (mEducation) and Electronic Learning (eLearning): The future of education has finally arrived! › Dinner at Bohol Bee Farm – One amazing experience!